Demonstrators chant during a march to police headquarters in Sanford, Florida, on Saturday. 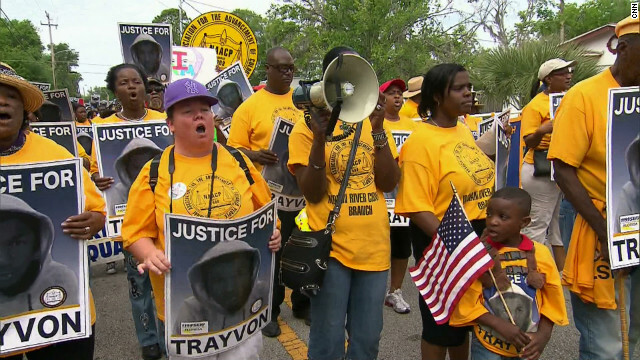 Sanford, Florida (CNN) — Civil rights luminaries joined throngs of protesters carrying “Justice for Trayvon” signs on Saturday, slowly marching to the Sanford police headquarters to demand the arrest of 17-year-old Trayvon Martin’s killer. “We will march on, we will rally, pray, petition, challenge elected officials, judges, law enforcement, attorneys, in the court house and in the White House, until justice for Trayvon Martin is real,” high school senior Clarence Moore III, a member of the NAACP’s College and Youth Division. Roslyn Brock, chairwoman of the NAACP board of directors, urged demonstrators to turn their anger into constructive action, telling them to register and vote. “Your vote is the key that will unlock justice in this community,” she said. Organizers said demonstrators arrived on buses from around Florida and the Southeast to participate in the rally, which came 34 days after neighborhood watch volunteer George Zimmerman fatally shot Martin after calling police to report him as a suspicious person. Zimmerman says he killed Martin in self-defense on February 26 after the teen punched him and slammed his head on the sidewalk before the fatal shooting, according to an Orlando Sentinel report that was later confirmed by Sanford police. Martin’s family and supporters say the teen was racially profiled and unfairly killed. The Sanford police department has come under intense scrutiny for its actions following the shooting, and protesters renewed their call for the firing of police Chief Bill Lee, who stepped aside temporarily this month amid the criticism. Authorities have said Zimmerman was not immediately charged because there were no grounds, at the outset, to disprove his account that he had acted to protect himself. Critics say that Zimmerman, who is Hispanic, deemed Martin “suspicious” and decided to follow him against the advice of a police dispatcher because the teen was black. Civil rights figures, including the Rev. Jesse Jackson, the Rev. Al Sharpton, NAACP President Ben Jealous and others joined the marchers at the rally, saying the incident was only the latest in a long string of incidents with black men, particularly, as victims of racially motivated crimes. “We’re here to say save our sons, bring Mr. Zimmerman to justice,” Jealous said. At a news conference that preceded the march, Jealous and Sharpton took pains to rebut reports that Sharpton’s National Action Network was considering a boycott of Sanford or Seminole County. Sharpton said such a boycott was “never on the table.” But he said he would consider action against businesses supporting efforts on behalf of Florida’s “stand your ground” law, which police have cited as a reason they could not arrest Zimmerman. The law allows people to use deadly force anywhere they feel a reasonable threat of death or serious injury. Critics say it is a “shoot first” law that justifies violence. A special prosecutor appointed by Gov. Rick Scott is investigating the case, as is the U.S. Department of Justice. In an interview Thursday with CNN’s Piers Morgan, the shooter’s brother, Robert Zimmerman Jr., questioned the competence of and the job done by Corey’s office thus far. “Ms. Corey’s investigation has been compromised,” the brother said. Florida Attorney General Pam Bondi stood staunchly behind Corey, in an interview Friday with CNN’s John King. She noted that Scott appointed Corey after consulting with her. That means being patient in the face of fervent demands from activists that Zimmerman be detained and charged as soon as possible, said the attorney general. Florida law allows the use of deadly force anywhere a person feels a reasonable fear of death or serious injury. It has been cited in a number of justifiable homicide cases in the state. But as more information surfaces, the picture of what happened between Martin and Zimmerman becomes more complicated. Despite the twists and turns, Sybrina Fulton, Martin’s mother, has said that she still has faith in authorities investigating her son’s case.